Shares of overall U.S. wealth held by the top households, from 1913 to 2012. (Click for a higher-resolution version.) Note that although the figure refers to households, the underlying data is actually from “tax units”, i.e., either a single adult or a married couple filing jointly. The graph is from Figure B1 in the Excel spreadsheet AppendixFigures.xlsx published in conjunction with the paper by Saez and Zucman referenced below. tl;dr: Is wealth inequality corrosive for democracy, and if so what then? It’s complicated…. Do you consider the increased concentration of economic wealth in the United States to be corrosive to our democracy? If yes, how should this issue be addressed? If not, why not? My answer: First, I don’t consider wealth inequality in and of itself to be a bad thing. I think it’s problematic only to the extent that a) it coexists with a diminishment of the economic prospects of those people who are not wealthy, and b) it enables the wealthy to pursue political policies that further that diminishment (not necessarily intentionally, perhaps as a byproduct of policies that otherwise have some positive benefits). Now, as it happens I think both of these things are true: Despite recent economic growth and a slow recovery from the Great Recession, we have not been living in times when all people have rising economic fortunes and prospects. Rather for some time now many if not most people have faced stagnant incomes and increasing economic uncertainty. Technological progress and globalization have cushioned some of this, by providing cheaper and more capable goods and services and opening up new economic opportunities, but at the same time these trends have also had the opposite effect on putting pressure on the wages of workers exposed to them. Since elites in general have more political influence than others—not just due to wealth but also due to their favored position in the overall social/economic/political networks that drive political decisions—they’ve generally been successful in having their favored policies adopted, or at least in blocking the adoption of policies they don’t favor. So what is to be done? One set of answers focuses on reducing the wealth of the extremely wealthy (for example through increased taxation) and reducing the effect of wealth on politics, for example through public financing of campaigns. I don’t think these are wrong answers exactly, but I don’t feel they address the roots of the problem. Another set of answers focuses on addressing the trends that lead to people accumulating great wealth and with it great power over others. Some of these are not just about the extremely wealthy; they also address wealth inequality between the merely upper middle class and everyone below them. Technology and automation. This encompasses not just the typical “robots are coming for my jobs” concerns, but also technologies like the Internet that enable firms to grow to much larger scale while depending on a much smaller employee base. This is an area where some of the biggest and splashiest new fortunes have been made (think Bill Gates, Jeff Bezos, Mark Zuckerberg, etc.). Ease of distribution, near-zero marginal cost to serve additional customers, winner-take-all network effects, and global reach combine to produce massive rewards for those people and firms able through talent, luck, and other means to achieve dominance in their sectors. Globalization. There’s no question that globalization on balance has been a boon to humanity, with increased trade lifting literal billions out of deep poverty in China, India, and elsewhere. However while the average worker’s income in traditionally poor countries has risen dramatically, the average worker in the U.S. has benefited mainly through cheaper goods as opposed to increased salaries. On the other hand, high-end U.S. workers benefit from being able to sell their talents into a larger marketplace. Financialization. Besides technological innovation, another major driver of wealth extremes is increased financialization of the economy, in which more and more economic activity is in the form of financial transactions only indirectly related to the production of goods and services. The consensus opinion seems to be that the underlying issue here is explicit and implicit (“too big to fail”) government subsidization of finance, ensuring that financial industries and the people who work in them can capture the upside while being protected against the downside (e.g., through bailouts). Goverment-granted monopolies and subsidies. This covers a whole set of issues: excessive copyright terms, dubiously-granted patents, industry-specific subsidies both explicit and implicit (as discussed above with regard to financialization), and so on. The preferred ways to address the distortions caused by great wealth will depending on what people think are the most important factors: for example, some advocate antitrust policy to address industry concentration in tech and finance, others advocate policies aimed specifically at reducing subsidies and artificial barriers to competition, and yet others have ideas on how to address the downsides of globalization. There’s no shortage of interesting ideas, the problem is how to take effective political action to implement them: the fact of great wealth translating into great political power means that actions in opposition will face an uphill battle to succeed. I don’t have any easy solutions for how to do it. I think to a large degree success will depend on “preparing the ground” for new policies (i.e., winnowing out the best ideas and figuring out how to effectively sell them), circumstances favorable to their adoption (e.g., another financial crisis for addressing excessive financialization), and straightforward political action and organizing to put things over the top. For reasons I go into in a future post, I am relatively pessimistic about things in the short term, but more optimistic in the long term. Here are some cherry-picked articles covering the issues I discussed above. These are of course subject to my own interests, predispositions, and even browsing history. (I picked them in part by doing an Internet search for key terms like “technology” and “inequality”.) You’re welcome to propose sources of your own. “Wealth Inequality in the United States since 1913: Evidence from Capitalized Income Tax Data”, by Emmanuel Saez and Gabriel Zucman, Quarterly Journal of Economics, 2016, 131(2): 519-578. 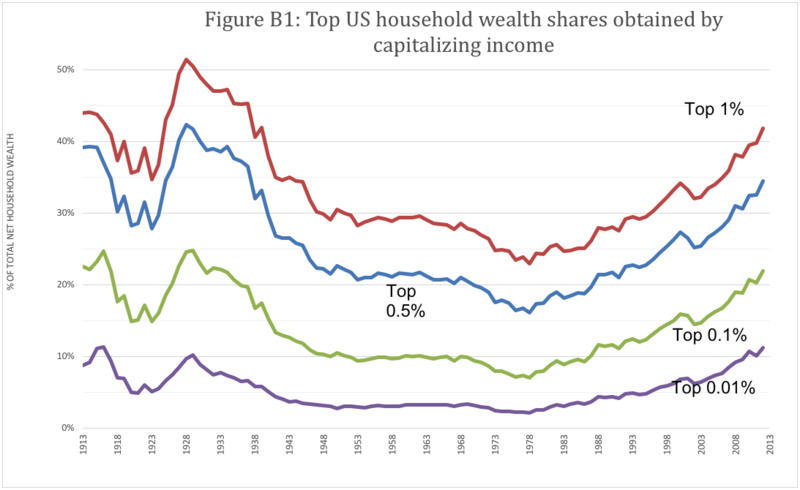 An attempt to measure the relative shares of U.S. wealth held by households over the period 1913 to 2012. The supplemental data for this paper are the source for the figure above. “You’re not imagining it: the rich really are hoarding economic growth”, by Dylan Matthews. A Vox article addressing various criticisms of measures of income inequality. (This includes, among other things, the criticism that measuring income and wealth by household instead of by individual is misleading given changes in family structure among lower-income people—a criticism that could be levied against the figure I reproduce above). “Technology and inequality”. From the MIT Technology Review, this is a representative example of the many articles written about the role of technological innovations in increasing inequality, with guest appearances by various prominent economists, including Thomas Piketty, Erik Brynjolfsson and Andrew McAfee, David Autor and Daron Acemoglu, and Robert Solow. “It’s time to think for yourself on free trade”. A Foreign Policy article by economist Dani Rodrik outlining his concerns about globalization, free trade, and “social dumping”. “‘Financialization’ as a cause of economic malaise”. A New York Times opinion piece by former Reagan/Bush advisor Bruce Bartlett summarizing the concerns of various economists about the role of finance in the U.S. economy. “Freeing the captured economy”. A series of articles from the Cato Institute journal Cato Unbound discussing the arguments in the book The Captured Economy by Brink Lindsey and Steven M. Teles.